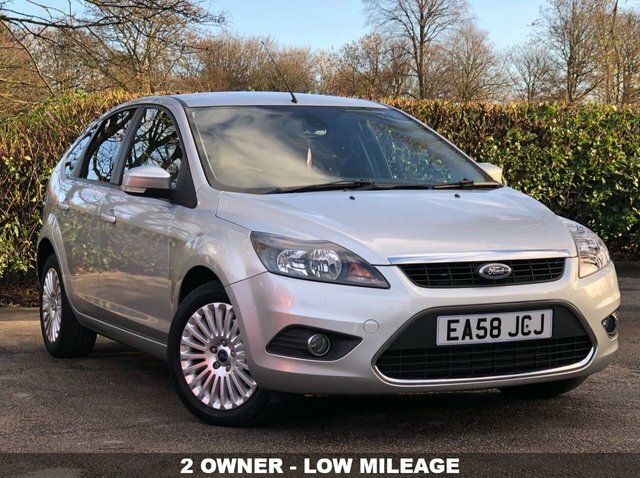 THE FORD FOCUS HAS BEEN WITH US FOR OVER 20 YEARS NOW AND IT'S AS POPULAR TODAY AS IT WAS BACK THEN DUE TO FORD STICKING TO THE FUNDAMENTALS, SMART LOOKING, GREAT TO DRIVE AND EXTREMELY RELIABLE. THIS VEHICLE WAS REGISTERED BY FORD AND HAS HAD ONE PRIVATE OWNER LOW MILEAGE VEHICLE WE HAVE ON SALE IS IN FANTASTIC CONDITION INSIDE AND OUT AND COMES WITH ALL THE FEATURES YOU'D EXPECT SUCH AS RADIO/CD, AIR CONDITIONING, FORDS QUICKCLEAR HEATED FRONT SCREEN, AUTOMATIC LIGHTS AND RAIN SENSING WIPERS. THIS CAR ALSO HAS SERVICE HISTORY WITH THE LAST SERVICE BEING DONE AT 35008 MILES. FITTED WITH THE SUPERB 2.0 TDCI ENGINE WHICH PRODUCES 140 BHP, ACHIEVES AN IMPRESSIVE 62.8 MPG AND COSTS £155 TO TAX FOR THE YEAR. INCLUDED IN THE PRICE WILL BE A FULL MOT + SERVICE + WARRANTY + 1 YEAR AA ROADSIDE ASSIST.